Osage City won a playoff game for the third consecutive season with last week’s 28-6 victory over Southeast-Cherokee. The Indians scored twice in the second quarter to lead 21-6 in beating the Lancers. Osage City quarterback Trenton Plinsky rushed for 63 yards and two touchdowns and River Davis added 79 yards rushing with a score. Plinsky, a 5-foot-5, 130-pound quarterback, has led Osage City with 1,139 passing yards and 21 touchdowns, while rushing for 775 yards and 13 scores. Both totals are team highs. Colton Prunty (380 yards) and Krimzyn Clark (330 yards) are the Indians’ leading receivers and have combined for 14 touchdowns. Humboldt trailed for the first time this season, but quickly gained control in beating West Franklin, 52-15. Dagen Goodner rushed for four touchdowns, while Conor Haviland added three touchdowns on the ground. The Cubs rushed for 526 yards in the game, led by Haviland’s 286 yards on 23 carries. Goodner added 210 rushing yards on 16 attempts. For the season, Haviland has rushed for 1,341 yards and 28 touchdowns, while Goodner has 842 yards on the ground and 17 scores. Goodner, the team’s quarterback, has passed for 761 yards and 12 scores. West Franklin and Southeast are the only two common opponents for the two teams. Humboldt beat Southeast 54-12 two weeks ago, while Osage City beat West Franklin 42-27 during the regular season. Rossville will travel to Atchison to take on the Maur Hill-Mount Academy Ravens in the first meeting between the two schools since 2015. The Bulldawgs advanced to the second round with a 36-14 victory over Pleasant Ridge. Rossville led 16-8 at halftime and 23-14 after three quarters, before two fourth-quarter touchdowns provided separation. Garrett Carver rushed for 118 yards and a touchdown, Tyree Sowers added 123 yards and a score, and Trevor Johnson also rushed for a touchdown. Carver also passed for 131 yards and two scores. He leads the team with 964 rushing yards with 16 scores, and has passed for 1,160 yards and nine touchdowns. The Rossville defense held Pleasant Ridge to 85 rush yards on 26 attempts, but did allow nearly 200 yards passing. That may play into the hands of Maur Hill, while has capability to throw the ball with junior quarterback Jack Caudle. Caudle has passed for 1,584 yards and 21 touchdowns on the season. He threw for 118 yards and two scores last week as the Ravens scored 20 points in the second half in rallying to defeat Mission Valley, 27-18. Sophomore Andrew Schwinn added 101 yards rushing and a score for Maur Hill in the win. Tate Vowels is the Ravens’ leading receiver with 778 yards and 11 scores. Comparing scores, Rossville defeated Mission Valley 34-6 a week prior to Maur Hill’s 27-18 win over the Vikings. In addition, Maur Hill beat Pleasant Ridge 38-22 in Week 7, two weeks before Rossville’s 36-14 win over the Rams. McLouth finished as the third-place qualifier from District 2, while Silver Lake was the district champion. The Eagles defeated McLouth, 56-6, back in Week 4. In that meeting, Silver Lake quarterback Mason Griffin passed for 103 yards and a touchdown, while junior back Tyler Redmond rushed for 54 yards and three scores. Freshman Gannon Remer also added two touchdowns on the ground for the Eagles. For the season, Griffin has completed 64 percent of his passes for 1,446 yards and 18 touchdowns. Tristan Stoner leads a group of four senior receivers with 375 yards and seven touchdown catches. Wyatt Heiman, Dillon Byrne, and Reid Walker have 354, 329, and 260 receiving yards, respectively. After going winless last season, McLouth improved to 5-4 and won its first playoff game since 2012 with last week’s 48-26 road win at Jayhawk-Linn. The Bulldogs shut out the Jayhawks in the second half after trailing 26-24 at the break. Riley County, Rossville and Southeast of Saline all finished 4-1 in District 4 and 1-1 against each other, though Riley County won the district and SE Saline was third because of tiebreaking points. The Trojans trailed 21-0 at halftime and came back to beat Riley County, 23-21, in Week 7. In the win, Southeast of Saline finished plus-1 in turnover margin and held a 205-125 edge in passing yards. The Trojans have doubled their win total from last fall and greatly improved its defense. SE Saline has permitted 14.3 points a contest after 31.1 allowed last fall. The Trojans have allowed five fewer total points than the Falcons. However, Riley County has tallied 39.6 points a contest, while SE Saline is at 26.7. Riley County’s Garrett Harmison has passed for 1,347 yards with a 18/8 TD/INT ratio. Senior Mikey Waggoner has rushed for 889 yards and 14 TDs. A win gives the Falcons their best season since an 8-3 mark in 2011 under longtime coach Steve Wagner. For SE Saline, Jaxson Gebhardt has passed for 1,229 yards with a 10/11 TD/INT ratio. The Trojans have their most victories since an 8-2 season in 2011 and captured a playoff game for the first time since 2006. Four of the top tacklers are all seniors, including 24 combined TFLs from seniors Colby Beer and Dylan Marks. The Trojans have averaged five yards per play, and Riley County averages 7.2 yards per play. The main difference comes in rushing yards – Riley County has rushed for 2,006, and Southeast of Saline has totaled 1,290 yards on the ground. This is a rematch from a Week 5 district game that Trinity won 20-7 on the road. Trinity has tallied 260 points but permitted 63, second-best in 2A. Garden Plain has scored 276 and permitted 134. Both teams have lost to Conway Springs, while Trinity defeated Chaparral, which beat Garden Plain. Trinity senior quarterback Kaleb Hammeke has passed for 684 yards with a 7/4 TD/INT ratio. Senior Aaron Guerrero leads with 686 rushing and eight scores, and Hammeke has 633 yards and 10 TDs. Trinity has just six turnovers and is plus-17 in turnover margin. Senior Zane Schroeder has delivered 103 stops, by far the team’s most. Last year, Trinity allowed 181 points in a 6-3 season that just 14 forced turnovers and was plus-3 in turnover margin. The Celtics have their most wins since a 10-2 mark in 2010. Garden Plain has a balanced offense, led by 65 carries for 377 yards and eight scores from senior Caleb Hitt. The Owls have 13 turnovers and are plus-3 in turnover margin. Sophomore Anthony Hays leads with 63 tackles. This is a rematch of last year’s first-round playoff game, also held at Cimarron. Hoisington, led by Sean Urban, rolled over the Bluejays, 35-6. This season, Wyatt Pedigo has replaced Urban in the backfield. Cimarron sophomore Tate Seabolt has taken over for his brother, Josh, at running back. Last season, Urban rushed for 1,539 yards and the elder Seabolt ran for 1,592. This season, Pedigo is at 1,642 yards, and Tate Seabolt has 1,474 yards. Pedigo has rushed for 22 scores. Hoisington has averaged 8.1 yards per play. Senior Derek Boxberger took over at quarterback for injured sophomore Mason Haxton and played solidly with 467 passing yards and a 3/3 TD/INT ratio. The Cardinals have just six turnovers but have forced only seven. The Cardinals’ top-three tacklers – Pedigo, sophomore Joshua Ball and junior Kameron Schneweis – are non-seniors. Pedigo leads with 72 tackles, eight for loss. Cimarron has won eight straight since it started the season with a weather-shortened loss to Elkhart. The Bluejays have averaged 7.7 yards per play. Senior Dylan Harrison has significantly improved the passing game with 590 yards and a 10/2 TD/INT ratio. Senior Anthony Erives has 81 carries for 754 yards and nine scores. Cimarron has 14 turnovers and is plus-2 in turnover margin. Hoisington is 3-0 in the series with all matchups since ’14 (48-6, 76-19 and 47-22). This margin should be much tighter. The two teams are very close, and this could be the best 2A playoff game on the western side. The Central Plains League rivals match up for the second time this season. Conway Springs, paced by its great line and running game, pulled away in the district contest for a 53-23 win behind 375 rushing yards. Collin Koester rushed for 123 yards, and Peyton Winter had 167 rushing yards. Conway Springs was plus-3 in turnover margin in the win and has had a big turnover margin in several key contests. In Week 8, Chaparral lost the lead late in the fourth quarter, 26-22, to Hutchinson Trinity. Conway Springs had beaten Trinity, 22-8, earlier in the year. Senior quarterback Jake Burke has enjoyed an all-state caliber fall with 1,343 passing, 947 rushing and 38 offensive scores. Senior Quinton Pfaff has 38 catches for 616 yards and eight scores. Conway Springs is 3-2 versus Chaparral in the last five years. Lakin has had its fourth straight season of record improvement under fourth-year coach Chris Bamberger. Last week, Lakin defeated Norton for its first playoff win since 1999. The Broncs have faced 2A’s easiest schedule and have an average score of 34-11, according to Prep Power Index. Junior Kayden Christiansen has rushed for 913 yards and 14 scores, and senior quarterback Juan Banuelos has 681 rushing, 353 passing and 10 TDs accounted for. Junior Hadley Panzer is one of the state’s top non-senior linemen. He leads the Broncs with 58 tackles, 6.5 for loss. Lakin has won five straight road games and is 8-1 away from home in the last two seasons. Phillipsburg has rolled through everyone, including quality wins versus Smith Center, Norton and Hoisington. The Panthers are one of four 2A undefeated teams. No. 1-ranked Phillipsburg has played the No. 20 SOS out of 48 squads. Phillipsburg has permitted 10 points a game but has scored 49 a contest. The Panthers rank in the top four in 2A scoring offense and scoring defense. Senior kicker Jonathan Hunnacutt set the state record for all-time kicking points earlier this fall. Senior quarterback Trey Sides, a four-year starter, and senior running back Treylan Gross pace the offense. A victory gives the Panthers double-digit wins for the fifth straight year. This is just the second matchup since ’04 and first since a 37-28 playoff win for the Panthers in 2011. Colgan will host Hillsboro in a game played at Pittsburg State’s Carnie Smith Stadium due to Pittsburg High’s home game with Bishop Miege. The Panthers and Purple Dragons share Hutchinson Field in Pittsburg with Colgan typically playing on Thursdays when both have home games. Hillsboro picked up its first playoff win since 2012 by rolling past Yates Center, 75-20. The Trojans scored 42 points in the first quarter and 21 more in the second quarter. Quarterback Jorge Hanschu rushed for 99 yards and Brooks Gardner added 109 yards on the ground. Freshman back Jamari Harris rushed for 62 yards and two scores, while catching a touchdown pass from Hanschu. Hanschu has passed for around 1,500 yards and rushed for nearly 750 more yards. Gardner has also added 725 rushing yards this season for the Trojans. Colgan cruised to a 68-8 victory over Leon-Bluestem to open bracket play. Colgan has averaged 265 yards per game on the ground this season. Colgan will have to battle through injuries to some key players and won’t be at full strength. The Panthers will try and maintain a ball control offense to keep Hillsboro’s playmakers off the field. Valley Heights and Jackson Heights will meet for a second time this season, but this time it will be just north of Holton. In the first meeting, the Mustangs and Cobras were tied at 14 with less than a minute to go in the game. Jackson Heights’ Kolby Rethman scored on fourth-and-goal from the 2-yard line to give the Cobras the 22-14 victory. Jackson Heights kept things on the ground against the Mustangs the first time, rushing for 281 yards led by Cooper Williams’ 112 yards and Conlan Bruggeman’s 102. Bruggeman scored the Cobras’ other two touchdowns in the game. Last week, however, Jackson Heights struggled in advancing to this round. The Cobras trailed Northern Heights (2-7) 20-8 in the first half and had to score 20 points after halftime to win, 36-28. Northern Heights had success spreading the field in passing for more than 315 yards against the Jackson Heights defense. Cooper Williams rushed for a pair of touchdowns for the Cobras. Valley Heights held off Lyndon, 30-22, last week. After Lyndon pulled to within 22-14 in the fourth quarter, Valley Heights answered with a long touchdown pass from Cameron Beardsley to Trey Martin to go up 30-14. Beardsley passed for 73 yards and two scores in the game. He has thrown for 469 yards and eight touchdowns this season. Cole Coggins led the Mustangs with 107 yards on the ground to give him 1,269 yards and 19 touchdowns this season. Coggins rushed for 1,288 yards and 19 scores a year ago to earn Kpreps 2-1A All-State honors. Jackson Heights defeated Lyndon 47-8 two weeks ago behind 302 rushing yards and six touchdowns from Cooper Williams. Pleasanton picked up its first playoff win since 2008 by holding off Marion, 28-22. Blake Pohlmeier rushed for 147 yards and two scores and added a touchdown catch in the victory. The game was tied 14-14 in the third quarter before Pohlmeier’s 55-yard touchdown run gave the Blu-jays the lead for good. Marion scored with under 30 seconds remaining to pull within 28-22. Olpe defeated that same Marion team 54-0 three weeks ago. Last week, the Eagles had no trouble in defeating Uniontown for a second time this season. In their two meetings, Olpe outscored its Eagle counterpart, 109-6. Camden Hoelting caught two touchdown passes and returned two punts for touchdowns. Colby Hoelting threw three touchdowns passes - two to Dawson McCarthy and one to Camden Hoelting. Olpe played without all-state RB/LB Blaine Hinrichs due to an injury. These two Twin Valley League rivals will meet for the second time this season. Back in Week 5, Centralia scored twice in the final 4:15 of the game to overtake Troy. The Trojans led 22-21 late in the fourth quarter when Centralia scored to take a 29-22 lead. The Panthers then picked off a Troy pass, and Kamble Haverkamp broke a long touchdown run shortly after for a 36-22 victory. Centralia has now won seven straight games after opening the season with close losses to Rossville and Riley County. The Panthers led Jefferson County North 36-0 at halftime last week in advancing, 36-14. Troy reached this round with a 54-21 win over Wabaunsee. The Trojans have scored three straight games since three close losses to Christ Prep (20-19), Centralia, and Jackson Heights (8-7). Troy has outscored its last three opponents 143 to 29, including a 54-8 win over Jefferson County North two weeks ago. This is a district rematch that Smith Center won 55-0. Smith Center has posted two close wins since a Week 3 loss to Phillipsburg against Plainville (21-10) and Ell-Saline (15-8). However, since Week 3, the Redmen have permitted only 26 total points. Smith Center is the defending 2-1A state champion and is 4-0 all-time versus Sacred Heart with four blowout victories. Sacred Heart, paced by senior wide receivers Trace Leners and Charlie Skidmore, has improved from 2-7 to 4-5 this season. Backup quarterback Mac Hemmer helped the Knights to a 34-7 win against Ellis last week by passing for 215 yards and three scores. This is a district rematch from October 5th that Sedgwick won 42-7. Sedgwick had a bye last week because of an odd number of teams in Class 1A. The Cardinals feature one of the state’s top passing offenses behind four-year starting quarterback Hooper Schroeder. Sedgwick is second in total points with 359 and has permitted 96, one of seven 1A teams to be under 100 points allowed. Meade advanced to this game with a 21-14 win over Syracuse. Caden Martin rushed for 100 yards and two scores on ten carries to lead the Buffaloes. This is a rematch from a playoff game last season that Plainville won 27-20 in double overtime at Brookville in a wild contest that featured multiple missed field goals, game-turning penalties and lead changes. This year, both teams – each nicknamed the Cardinals - are virtually identical across the board, though Ell-Saline has played a slightly harder SOS. Ell-Saline has a total margin of 312-104 versus the No. 7 SOS, and Plainville is at 314-99 against the No. 23 SOS. Plainville played Smith Center to a 21-10 loss, and led most of the second half in a game that went down to final minutes. Ell-Saline lost, 15-8, to Smith Center in a game that came down to the final seconds. Both teams feature a star quarterback with Plainville’s Jordan Finnesy and Ell-Saline’s Nick Davenport. Each team has stars on both sides; Plainville has Jared Casey and Tanner Copeland, Ell-Saline counters with Sawyer Kramer and Treyton Peterson. Ell-Saline’s other loss came 8-6 to Hutchinson Trinity, but also has a 27-13 road-win versus Sedgwick. Inman has enjoyed a mammoth improvement from 0-9 last year to 6-3 this season. 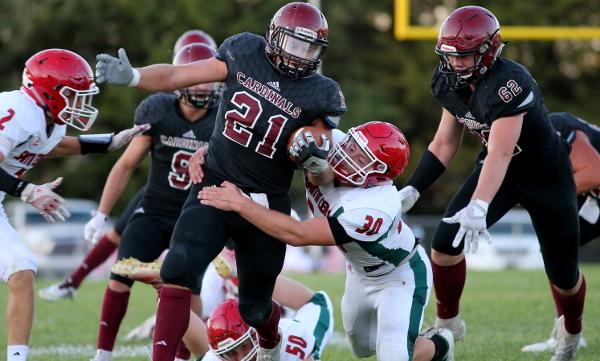 Senior Matt Ramey, who missed last season with injury, has cleared 1,000 rushing yards, though did not play last week in a 44-10 victory versus Stanton County. Inman has received impressive line play from Mason Thiessen and Wyatt Meier. Elkhart has remained in the top-5 of 1A all season and has been one of the prevailing stories of 1A this year as it looks for possibly the best season in school history. The Wildcats remain the only team to defeat Cimarron (8-1) in a weather-shortened Week 1 contest, and then have powered through a softer schedule. A victory gives Elkhart its most wins since before 2004. Elkhart captured eight wins last season and also in 2013. Elkhart has rushed for 323 yards a game. Senior quarterback Lane Whisennand has rushed for 1,383 yards, passed for 722 and accounted for 32 scores. Senior Westin Boaldin leads with nine TFLs. Elkhart leads the classification with 402 points scored.